Kilimanjaro, a duet with Javed Ali. I was quite tickled and was giggling about the lyrics. Really fun lyrics I thought. Javed Ali is a soft spoken, sweet person. And really loved his style of rendition. The session was super fun through and through. From the time I stepped in to Rahman sir's studio and recorded this song I have been praying for it. Its hard to describe how do I spell the "tcht tcht" in the song? Well I guess you ll know what I am trying to write about once you hear it. And that I think is my favourite portion in the song. I presume this is the song that was shot in Peru / Machu Pichu with all the fancy headgear. And Superstar's style - Thalaivaaaaaa!!!! I cannot wait to watch the film and scream all through the FDFS. I think the first ever FDFS of a film in my life was Shivaji. Cannot forget that day. Whatte-n experience. I couldn't hear a single dialogue. But that is not the point is it? All we can do is cheer and scream every time Thalaivar came on screen. Please do buy the original CDs. Now days ur just trying with various style ...voice rendering in this particular song is sounds good ....did u tried the starting humming? I saw you in manothodu mano program..you have an awesome voice and when you became emotional about your struggles in life, everybody was moved in my family.. you know, I have a 9 year old niece shruthi who is s great fan of yours..she has been learning music for 4years now..she wants to become like you and that's quite an impact you have made in the minds of youngsters..moreover you look great in the pictures of your blog..I was too an ex employee of sify..you are a good stage performer so you gotta try those grammy in near future.. my hearty congratulations for the soul rendering song in Endiran.. keep up the good work buddy! CHINMAYI THE ROCKER! I just bought the Enthiran album an hour back. Listening to Kilimanjaro as I am typing this !!! you sound awesomely different !!! never knew it was you until I checked the credits !! Take a bow Chinmayee ! My pick of the album however is Pudiya Manida; but the next one is definitely Kilimanjaro !! ARR rocks !!! chinmaye,as u always say that.elle pughazhum rahmanukae.i pray to god that u will reach for the sky.i saw ur program manathodu mano.that was superb. as a friend i can tell u something in that program ur hair style was not that much good so please don't try that hereafter.apart ur the only best voice to me. Quite easily the 'fresh sounding' piece in the album. Punky beats, and your voice frequency modulation Awwwsome..
@ others the opening bit and various others 'goat like' sounds in the SPB song are by Rehaina. Good one, yet another round of experimentation. Kudos to you and Rahman. In the Kilimanjaro song, your sangadhi in the first charanam, "...enna vandhu aara vaithu...." blew me away. Are sangadhis like these suggested by ARR or does it come as a way of your own improvisation? Because Javed Ali doesn't do that in the second charanam. this is saya.iam a diehard fan of you.you looked so beautifull in sangeetha mahayudham.keep on rocking like this. 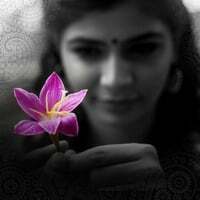 hai chinmaye you r blessed with a beautifulll voice.i pray to god that you will reach for the sky. Hi Chinmayi, The song was brilliant and your voice was awesome..... It was different and naughty !! Certainly an instant flick !! Kudos and all the best !! Heard the songs. Particularly ur voice in Kilimanjaro has been different and good. Its goin to be a good one to hear. Once again, congrats.. I know accolades are pouring in. Yet another feather in your cap. Your Rajini sir Fan?. me also die heart fan. Enthiran songs are very nice. i saw you on star vijay radio merchi uninor music award function .nice to see you with mom. take care and take care of your mom. Didn't recognize ur voice until i saw the playlist. Keep giving us numbers like these.. The song is very good. Its good. Yep with Thalaivar's inimitable style it should be great. Nice rendering. Refreshering song.Good work. Btw.. i was reminded of "Azagina Azagave Askava" tune a bit from U20E18 may be at the begining! Enjoyed all the songs in Endhiran!! Kilimanjaro song came out well!! Congrats and all the best for the success!! "Kilimanjaro, the penultimate number in the album, is quintessentially Rahman. A playful and quirky song with an infectious refrain and a thumping beat, it features some lively vocals by Javed Ali and Chinmayi. It has tribal-sounding interludes, but manages to be super-modern at the same time, and grows on you with every listen. Quite likely to become one of the immediately popular numbers from the album. " I really admire you. I think you are truely awesome. Whenever your autobiography comes out I will be one of the first in line to get it. I wish i could sing but I can't. But i am happy I have enough music sense to enjoy good music. Heard it in Raaga.com. I will surely buy the CD. Looks like your Legend's blueeyed girl. You get his best songs ( Kilimanjaro) is uniquely different apart from Irumbile Oru Idaiyam ( ARR's unique singing) and SPB ( another Imayam) opening Salvo for THALIAVAAR. Waiting for the movie to be released. I already got an original CD!!!! Wonderful song!! Keep it up!! And Kilmanjaro is really different...really liked the way it has comeout.. Looking for more of your numbers..
just love the variation of ur voice.. am sure its gonna be a big hit..
As with all ARR compositions, we can get glued on listening to his tracks repeatedly. 'Kilimanjoro' is awesome, this is the song i am humming these days. You are a versatile singer Chinmayee. It is different... and very good. Thanks for the superb song. Also to Javed Ali. Wat a song!!! And what a rendition.. beautiful. I really loved it the way you sung it.. esp.. the kinni koli.. I reaaly hope Rahman sir gives you more challenging songs like this more and you collaborate more with him. I heard all Endhiran movie songs when the song release.All songs are very nice to hear.Always AR Rocking.Kilimanjaro song is very cute.I cant able to identify ur voice in this song.did u changed ur modulation for this song? so cute chins. One more thing, saw you on Chote Ustad. Really amazing.... You are going places chinmayi. What else is left in your kitty?. Very good song Chinmayi... I love the song Kilimanjaro very much. hey...this is the best song of the album...nice!keep going!! You are just awesome in this Song....Amazing!!!!!! Totally an addictive song! Its an universal song! everyone is jumping to the tune and the song.. :) Loved it totally akka! I wish you had sung the very sweet Kaathal anukkal instead. Btw, Im SO hooked on to maadhno, hope you win a filmfare best vocal for it this year! I'm from Malaysia and one of your fan i would say. Am not a frequent blogger and seriously i never had the thought that i will bump into your blog and seriously never ever had the thought that a CELEB like you will have a time to blog atleast. Perhaps it may my own perception or it could be rather true also. But am pretty happy that you taking your precious time to update and share your activities and opinion with others. May this be a platform for me to atleast communicate with you and am just truly excited once saw your replies for some of your fans comments. Hope i too get the replies from you. 1st i would congratulate you on your awesome work in ENDHIRAN's Kilimanjaro. The song simply superb and you've done a great job. Basically am a die hard fan of AR.Rahman and i was actually growing up by listening to his musics. Such a Man he is, be it where he stands, he remains as humble as he can and i just cried when he said " ELLAM PUGAZHUM IRAIVANUKKE" during the academic award function. It shows how much he has dedicated himself to the great lord and also not forgotten his loving mother. He is my IDOL. Dear Chinmayi, am glad that your working along with him and giving us lot's of mindblowing songs. May your journey in this creative world continues until the last breath of yours. We are here, to support your musics. As i do believe music is the most powerful healing tool for any kind of sickness. May god bless you and continue your journey. Please convey my best wishes to SHRI AR.RAHMAN!!! whats FDFS? why am i even asking here, like i'm gonna get a reply. if i do get one, that'd be much appreciated. My fave song in Endhiran is Kilimanjaro and mainly due to your singing... its a very good listen and I liked the way you dominated the song particularly in the 2nd paragraph... it was pacy and unique. Well done and thanks. Heard it(of-course in originals)...! was awesome...!! u sounded a bit different! Chinmayi, I've always wondered how it would be to personally know a famous genious - someone like ARR or Kamal Hassan. And I'm envious of normal people like you who live in the midst of such celebrity geniouses - because you get to discuss with them, ask a million question that I'd die to get a chance to. How do they make those tunes. What's the thought process behind using a certain instrument/sequence/sound. Do you get to do all that? On another note: I feel the amazing music ARR has again come up with has been marred by some of the lyrics. Ofcourse, it's just my opinion, but I wish all songs had good lyrics like Puthiya Manidha. Surprised you like the random (read ridiculous) lyrics of Kilimanjaro. But amazing vocals, really. You've done some great modulation there. Hi Sis, Very different tone of yours. Well I am not so definite about the musical terms, I just love the song. It is definitely a milestone in your singing career. And I love the way you host Sangeetha Maha Yutham..
Well sung. (Both the artists). Rahman gets the best out of your talent. Didnt realize it was you singing till I saw the credits. Good for you as you are not stereotyped. Congratulations Chimayi ....for winning this one more Award from Filmfare. Really your voice in kilimanjaro, especially that part u like is awesome.. Is there any organisation of you that i can join so that i express myself as a true fan. I ended up here after I hit a Google on the person doing that "titch titch" thing in Kilimanjaro song. You sound absolutely fresh in the whole song. Great job! Looking forward to more such works from you. goood yar ..hesred the song! you sung that song well...did you find it tough to sing? Unga pattu kaeta udane, arraka paraka vandu comment panna....! My comments got burried engayo.....So, innum oru darava....! Great work! Count me in with your already huge fans list. Awesome Chinmayee! You sound so different in this one! As always keep rocking! ஜாவீது அலி மற்றும் உங்களின் குரலில் "KILIMANJARO " பாடல் "ஆஹா ஆஹா " எத்தனை கலக்கல் . சூப்பர் ஹிட்டாக வாழ்த்துகள். மற்ற பாடல்களும் அருமை. I thought that you would usually fit into melodies but you proved that you can do even a raunchy number like this one. Hi chinmayee, I am writing here for the first time. I searched for the name of the singer after I listned " chinnamma chilakamma" song. After that this song, your voice is too good. I listened Kilimanjaro song.. Itis good. Keep going... your timing in stressing words is too good... :) Hope we here more telugu songs from you... Good Luck!!! I dont understand Tamil but when I heard Kannathil Muthamitaal first time I became fan of yours. And now I am listening Kilimanjaro. You are versatile singer. Dear Chinmayi, Konjam latea comment panren.. Kilimanjaro is just awesome.. Very different lyrics for this song..
You are blessed.. Take Care. hi whats up.just saw on chhote ustad & i was listening to the album robot 2010 the hindi version soundtrack.killimanjaro is awsome. your voice is amazing..love from pakistan. Kilimanjaro is a awesome song. i like very much "tcht tcht" in the song. I am a big fan of u..
Chinmayi, How u did this "tcht tcht"? Have u recorded it once and was played multiple times in the song or u did it repeatedly whenever needed? Whenever we try to do the same, we mostly fail. Very hard and very good. Very very good.